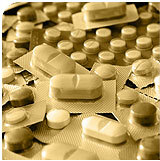 One of the oldest and still most widely used anti-epileptic drugs (AEDs) is carbamazepine. Carbamazepine works for epilepsy by blocking voltage-sensitive sodium (Na+) channels. It comes in many forms including liquid suspension, chewable tablets, and tablets known as Tegretol®. It also comes in two extended release forms Tegretol-XR® and Carbatrol®. It is generically available and therefore quite inexpensive. The Tegretol-XR® form works on the principal of a tablet which does not dissolve but rather allows water to enter through tiny pores and force out the medication. This slows the absorption of the medication and allows for twice a day dosing. The Carbatrol® works by using a series of three different beads that dissolve at different rates and therefore spread out absorption and again allows twice daily dosing. In the Carbatrol® method, the capsules can be opened and the beads can be taken over food or with a spoon for those who cannot swallow. Tegretol is the only medication FDA approved for trigeminal neuralgia. This approval was in an era when the FDA was not as strict and I suspect it would not be approved today without additional information. Prior to the more modern neuropathic pain medications (gabapentin or neurontin, pregabalin or Lyrica, and duloxetine or cymbalta) it was more widely used for all neuropathic pain. Like all seizure medications, Tegretol can cause sleepiness and balance difficulty. It also has a small chance of causing liver, bone marrow toxicity, and electrolyte imbalances. For this reason, it is less commonly used than some of the newer agents like Trileptal.